Less of an accessory than a serious tool for the drummer who records regularly (or even the studio owner who requires their capability), the mics are expensive but their exceptional performance justifies the outlay. Warm, open, expressive sound. Pressure-sensitive cardiod condenser mics. Captures a room's ambience perfectly. Not good for close miking. The mics that make up the kit are sourced from Blue's signature series. The mics come with a solid, lightweight flightcase. This striking trio of drum mics is all that American company Blue Microphones reckons is required to produce a killer drum sound. A world away from close-miking individual drums, the Blue Drum Kit Kit - to give it its full title - clearly subscribes to the less-is-more school of mic placement. Blue Microphones was formed in 1995 by musician Skipper Wise and recording engineer Martins Saulespurans. From the outset Blue has dealt in high-end mics, focusing particularly on studio tools. As well as providing standout performances, Blue mics tend to pair imaginative designs with equally original names. "If it's a warm, open, expressive drum sound you want, it doesn't get much better than this." The three microphones that make up the kit are existing Blue mics that have been sourced from the company's Signature series. A single Mouse mic is partnered by a pair of stereo-matched Dragonflies. 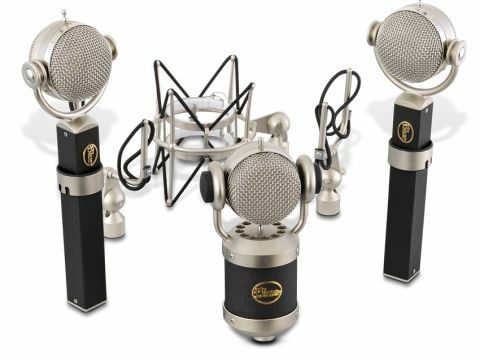 All three are pressure-gradient cardioid condenser microphones and share the same large-diaphragm capsule design. On both models the capsule is attached to the front of the mic by a yoke, keeping it separate from the main body of the mic. The capsule pivots within the yoke allowing movement for mic placement. Supplied shockmounts provide additional manoeuvrability whilst also isolating the mics from vibrations. Though the Drum Kit Kit can be used in a live scenario, its primary application is in the studio. We took a four-piece kit and cymbals to Antenna Studios in London, where sound engineer Darren Doherty provided expert assistance. The three mics are deployed around the kit in what could be termed as ambient positioning. The Mouse can be pointed directly at the front head of the bass drum, but needs to be at least a foot away from it - any closer and it is too hot. Meanwhile the two Dragonflies are rigged high up over the kit, angled from behind so as to be pointing equally at the drums as the cymbals. This miking method captures both the kit and its relationship to the room it is in. In contrast, more conventional close miking focuses on each component individually, building a picture of the kit through the channels of the mixing desk. By way of control, Darren simultaneously recorded the kit using Glyn Johns' four-mic method with Antenna's own industry-standard mics. The contrast between the two set-ups is revealing and absorbing. Though the control quartet of mics gives a perfectly good drum sound with a degree of ambience, the result still sounds like a recording. In comparison the Blue mics seem to conjure up the physical presence of the kit. The jump in the level of detail is akin to watching a film on VHS then switching to a DVD version. Every component of the kit is articulated faithfully and with needle-sharp clarity. Before recording we were doubtful as to whether the snare would figure much without a dedicated mic over it, but listening back, it not only cuts through, but keeps all of its body and warmth. The bass drum is as deep, punchy and airy as it is in real life, with no exaggeration or flattening of its frequency range. Similarly the toms are uncannily realistic, rendered with all their juicy tonality intact. We incorporated dynamic extremes into the playing, going from a pin-drop tap on the ride cymbal to crashing it in the midst of a Moon-style thrashing: everything is reproduced faultlessly. When attempting to describe the quality of sound, the word that we keep coming back to is 'natural'; on playback the kit is as full and balanced as it is in the flesh. It's fair to say that there are probably as many drum miking methods out there as there are musical genres and the Blue mic trio won't necessarily give the most appropriate results every time. However, if it's a warm, open expressive drum sound you want (Blue reckons similar three-mic rigs were used to record, among others, John Bonham, Keith Moon and Mitch Mitchell in their prime) then it really doesn't get much better than this.